CITRICIDAL® Liquid Concentrate provides the highest available concentration of pure grapefruit extract. Each 1 oz. bottle contains approximately one thousand (1,000) drops. Numerous uses include oral consumption for dealing with unwanted, indicated conditions, external use for the skin and scalp, and a myriad of household uses. 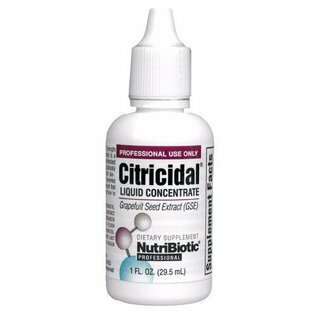 Note: CITRICIDAL® is a natural quaternary compound synthesized from the seed and pulp of certified organically grown grapefruit. Employing a manufacturing process which converts grapefruit bioflavonoids (polyphenolics) into an extremely potent and biologically active compound, CITRICIDAL® has proven highly effective in numerous applications. CITRICIDAL® is used clinically to provide not only gastrointestinal and topical benefits, but systemic support as well. Caution: Do not put in eyes. Do not use full strength in mouth, ears, nose or sensitive areas. May cause irritation if used full strength on skin. Orally: Suggested Use: 2-5 drops mixed in 5 oz. of water or juice, 2-3 times daily, with or without meals. Children (under 10 years): 1-3 drops mixed in 5 oz. juice 2-3 times daily. Do not use full strength in mouth. Throat Gargle: Stir 1 drops of CITRICIDAL® into a small (3 oz. or more) glass of water. Gargle several times. Use as often as needed. Always dilute. Ear Rinse: Thoroughly mix 1-3 drops of CITRICIDAL® with 1 oz. of glycerin or alcohol. Apply 1-2 drops of this solution in affected ear 1-2 times daily. Use as often as needed. Do not use full strength in ears. Nasal Rinse: (adults only) Mix 1 drop of CITRICIDAL® with 6 oz. of water. With head tilted back, fill each nostril with an eye dropper full of mixed solution. Drop head forward and down (head is now upside down) to force solution up into nasal passages. Return head to normal upright position and allow nasal passages to drain. Do not inhale through the nose during this procedure. Always dilute. Vaginal Rinse: Mix 1-2 drops of CITRICIDAL® in 8 oz. of water. Douche once daily for one week or as directed by health care practitioner. Always dilute. Facial Cleanser: Thoroughly moisten (splash) face with warm or cool water. With hands still wet, apply 1-2 drops of CITRICIDAL® to fingertips and gently massage facial area with circular motions. Rinse thoroughly with cool water and pat dry. A tingling sensation may follow. This is an indication of the deep cleansing properties of CITRICIDAL®. Always dilute. Skin Rinse: (minor skin irritations) Dilute CITRICIDAL® with water (1-3 drops/tablespoon). Apply this solution directly to affected area twice daily. Do not use full strength on skin. Nail Treatment: Dilute CITRICIDAL® with water or alcohol (1-3 drops/tablespoon). Apply this solution directly on surface of nail along the cuticle and underneath the front of nail, or soak nails, twice daily for as long as desired. Do not use full strength on nails. Scalp Treatment: Add 2-4 drops of CITRICIDAL® to each shampooing (mix in hand or on head with shampoo). Massage into scalp and leave on for at least 2 minutes. Rinse off thoroughly with water. May also be used without shampoo. Toothbrush Cleaner. Stir 2-4 drops of CITRICIDAL® into a glass of water. Submerge toothbrush for 15 minutes (or leave in between uses). Rinse toothbrush before using. Change water and remix every few days. Vegetable/Fruit or Meat/Poultry Wash:. Sink washing - Add 20 drops of CITRICIDAL® to a sink full of cold water. Briefly soak any vegetables, fruit, meat or poultry. Rinse if desired. Spray washing - Add 10 or more drops of CITRICIDAL® to a 32 oz. pump sprayer filled with water. Spray on any vegetables, fruit, meat or poultry. Dish and Utensil Cleaning Additive: Add 10-20 drops of CITRICIDAL® to sink dish washing water or to final rinse. Add 10-20 drops to automatic dishwasher with detergent or to final rinse. Cutting Board Cleaner: Apply 5-10 drops of CITRICIDAL® to cutting board and work into entire board with a wet sponge or dish cloth. Leave on for at least 30 minutes. Rinse with water. All Purpose Cleaner: Add 15-30 drops of CITRICIDAL® to any 32 oz. pump sprayer filled with water or cleanser. Use on all surfaces around the house. Caution: Do not put in eyes. Caution: Do not put in eyes. Do not use full strength in ears, mouth, nose or any sensitive areas. If contact occurs, flush with water for at least 10 minutes. Irritation is temporary and could last 48 hours. CAUTION: If pregnant, breastfeeding or have epilepsy, consult your healthcare practitioner before taking this product.